The opening ceremonies of the olympics are tomorrow! 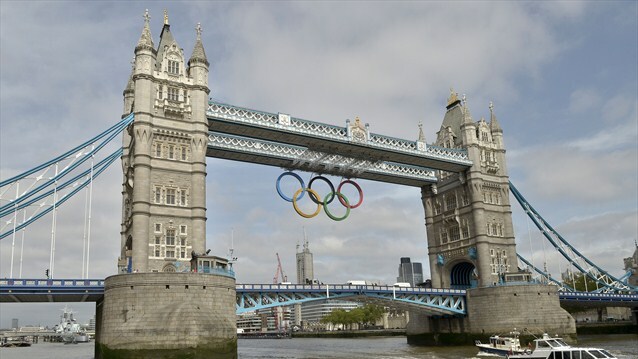 London 2012 will officially begin. For the next 17 days the olympics will most likely cover your TV, internet & social media. Don’t let the fun stop there! Here are some patriotic ways to show support for the US in all of your daily activities. This would be a great look for shopping with friends! Tone down the red pants with neutral shoes & bag. I love pairing colored denim with chambray. Headed out to brunch on Sunday morning? Try a maxi dress for effortless chic! Aim for gold with a long necklace and accents on an envelope clutch. Errand day? Pair a neutral white skirt with a black tank to stay cool in the summer heat. Pair them with a red statement necklace and gold accessories. Don’t forget a watch so you don’t miss your favorite sport! Headed to an olympic viewing party and/or barbecue? I love these painted shorts, they would be a great DIY project! Paired with a white blouse contrasts the model off duty look of converse. Check out all of the shopping details on my Polyvore!